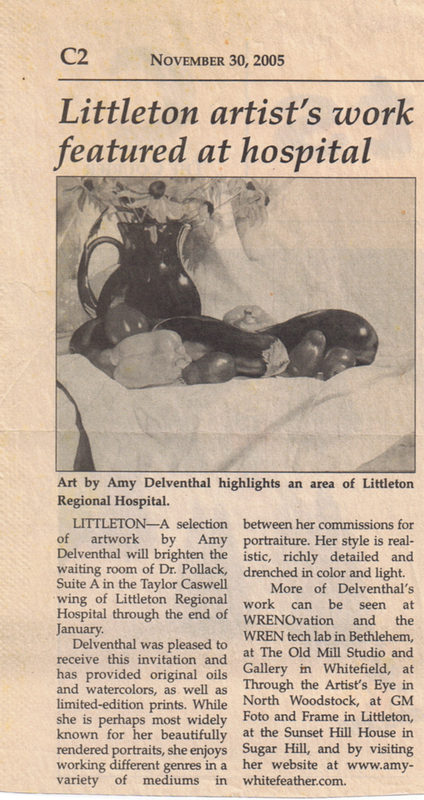 LITTLETON – A selection of artwork by Amy Delventhal will brighten the waiting room of Dr. Pollack, Suite A in the Taylor Caswell wing of Littleton Regional Hospital through the end of January. Delventhal was pleased to receive this invitation and has provided original oils and watercolors, as well as limited-edition prints. While she is perhaps most widely known for her beautifully rendered portraits, she enjoys working different genres in a variety of mediums in between her commissions for portraiture. Her style is realistic, richly detailed, and drenched in color and light. 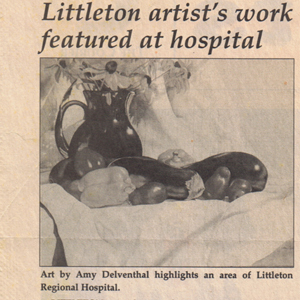 More of Delventhal’s work can be seen at WRENOvation and the WREN tech lab in Bethlehem, at The Old Mill Studio and Gallery in Whitefield, at Through the Artist’s Eye in North Woodstock, at GM Foto and Frame in Littleton, at the Sunset Hill House in Sugar Hill, and by viewing it at her website.